Riki Kid's Set includes a table and two small stools that can be assembled just by folding, and no adhesives are needed. The stools perfectly fit under the table for the storage. Children can draw on the surface and it becomes special table set for them. It is also selected by kindergartens to encourage creativity. Prized for Mainichi Design Award in 1967 and Kids Design Award (Future Products Category) in 2011. After having graduated from the Woodcraft Department at Tokyo Higher School of Arts and Design (nowadays: Chiba University), he joined Gunma Prefecture Industrial Arts Center where Bruno Taut was working in 1936. In 1949, Watanabe established his own designing studio. He got famous by the low-cost String Chair in 1952. Watanabe's Torii Stool and Circular Center Table won the Gold Medal at Triennale di Milano in 1957. Besides interior and furniture design, Watanabe has also designed clocks and watches. His 1972 design, Hibiya Dai-Ichi Life Insurance Company's pole clock is defined as one of Watanabe's major works. 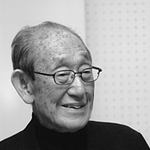 Watanabe is considered to be one of the pioneers of after-war Japanese design.